We told you that Tri City Sports PL would be providing All About Cards with a Hall Of Fame Auto for a contest. We also told you that at the beginning of May we would be getting details on which card that is and the rules for the contest. Well Tri City Sports PL has contacted us with the information. To be fair, this contest will be different than we thought it would be. Tri-City Sports PL has determined the rules for this contest, and while we thought they would be providing us with a card, Tri-City Sports PL will hold on to it and be handling any potential prizes, so really, this is their contest. How it is run is out of our hands. What they have done is provide a picture of the card. Here it is. 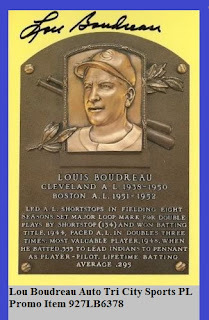 As you can see it is of Hall of Famer Lou Boudreau. Now here are the rules as Tri City Sports PL has provided to us. I’ve taken this directly from their email to us, and I am quoting here. 2. They must guess what you pull from your street break if they guess all 3 cards right they get the prize which is the HOF 1/1 promo auto (if they guess 2 of the 3 they will get a diffrent promo which they will be able to choose what sport they want either baseball or football or soccer. So I anticipated that you all would have a lot of questions about the rules, so I contacted Tri City Sports PL and here is what they said. Once again, I’m quoting. Question – Will people have a complete checklist of all possible cards to help them guess? 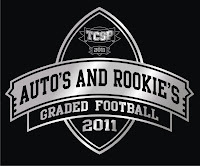 Answer - Unfornatly we cant legally post a full check list just because we did not produce the graded cards but we can tell you that all the big name are in the set from the last 40 years of football. Question – What happens if we don't have a person that guesses three of the cards or two of the cards? What happens we only have a person with one card guessed correctly? With our promo guidlines a person has to guess at least 2 of the 3 to win a promo prize. So if you want to get in on this second chance contest that Tri City Sports PL is running, head on over to www.Tricitysportspl.com and register to become a member. Then come back here and leave your answer in the comments section along with your Tri City Sports PL member name so they can confirm if there is a winner. 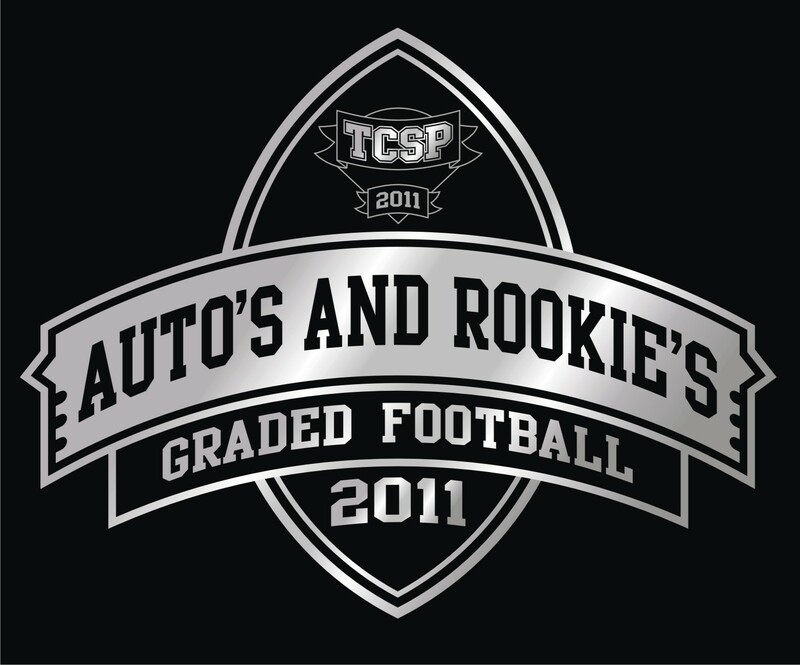 Tri City Sports PL will close the contest at the end of May 9th/ 2011, so make sure to get your guesses in by then. UPDATE: We were starting to get emails and questions about this contest and the rules. In order to clarify exactly how this contest is being run, I emailed Tri City Sports PL to get answers to some questions as I am not running this contest, and therefore could not answer these myself. Here are the questions and the answers from the email I received from Tri City Sports PL. 1 - We have readers from every part of the world. Is everyone eligible to win or are certain areas excluded from this contest? 2 - In past Tri City Sports PL contests, the winner of the prizes has had to pay for shipping. Will Tri City Sports PL be shipping the prize for free or will the winner have to pay for shipping? If the winner has to pay for shipping, what will be the cost for shipping to the US? What will be the cost for shipping internationally? 3 - What happens if there are two or more people who guess all 3 cards correctly? Will each person win a prize? If there is only one prize, how will the winner be selected? 4 - What happens if there are two or more people who guess only 2 cards correctly? Will each person win a prize? If there is only one prize, how will the winner be selected? 5 - If one person guesses 3 cards correct and another guesses 2 cards correct, will both of them receive a prize? 6 - If someone guesses 2 cards, what are the exact player name and card types for each sport that they get to choose from as a prize? 7 - When will the winner be announced? 8 - When will the prize be shipped to the winner? Question: is the "winner" going to have to pay for shipping as well? This is a legit question to be asked of Tri City, as "winners" of their promo codes in the original release had to pay at least $15 to get their prize. Thanks.